Yes, it’s true. January brings with it lots of responsibility. The presents and cheer of December are faded memories that went into the trash with the wrapping paper and tinsel. But fear not. Whilst we’re knee-deep in juices and cleanses and new exercise routines, we have at least one special occasion that requires (no, DEMANDS) indulgence. And that, my friends, is the Golden Globes. I was beyond excited when the feedfeed + Lindt Chocolate asked me to create a decadent, beautiful dessert for our Golden Globe parties (Lindt is the Official Confection of the Golden Globe Awards for the second year running…people, this is exciting stuff!). And we’re having Golden Globes parties…even if we’re in our pajamas…it’s happening. I always strive to bring you accessible recipes and I know what you’re thinking: that this dark chocolate cake looks hella difficult. But she’s deceiving. She’s actually a basic rich (and delicious) dark chocolate cake coated with champagne buttercream jazz hands. I love jazz hands. This bubbly addition is mostly an excuse to drink champagne while we bake + frost cake. We’re also making a naked dark chocolate cake so that mistakes look like they’re by design. Then we bust out the flowers to mask errors further. Lastly, we’re throwing edible gold leaf about and channeling our inner J.Lo. 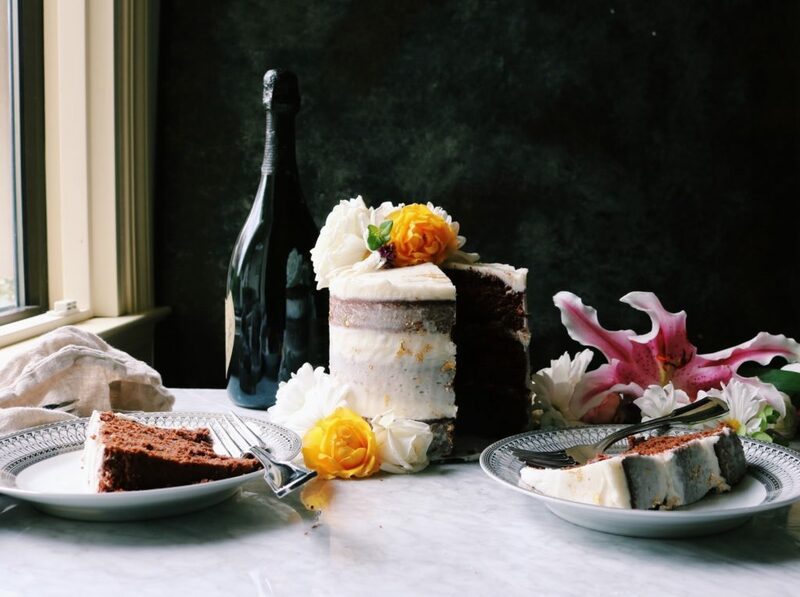 And yep, don’t fret, we can make the dark chocolate cake + champagne frosting ahead of time. You’re welcome. Patience. Mix your ingredients on low. I can’t stress this enough. If you have your mixer on high, you’ll whip too much air into the cake batter and you’ll get an annoyingly domed cake thing happening that makes frosting and stacking cakes near impossible. Champagne. Pick something you would actually drink…because you’re not using that much for the frosting and you deserve a glass. And that should be your policy regardless when cooking and baking with booze. If you don’t drink alcohol, feel free to use milk to thin the buttercream. Flowers. I had all of these great plans to go to the florist and get exotic flowers and then I thought: why? These are from my backyard and the grocery store. I like having mostly white and then grabbing some brighter flowers for pops of color. I steered clear of red because the holidays are already a distant memory. Edible gold leaf. Pull up a chair. Let’s talk gold leaf. First, I’m not going to lie…it’s tricky. Make sure you get edible gold leaf…that’s extremely important. The kind I used came in sheets. Make sure you don’t have the heater (or AC) on while you’re using it…it’s like tissue paper meets plastic wrap…it will blow around and stick to everything with the slightest air movement. The gold sheets should have a tissue paper backing, use that to maneuver it around the cake. I will give you more tips below…but allow time to get zen and zoned out while putting it on the cake. You’ll need a clean, never-before-used paint brush to apply it to the cake. I don’t want to scare you…but knowledge is power. PS There are lots of videos of people using gold leaf…watch a few. It’s extremely helpful to watch professionals handle this wily beast. Room temperature. Sometimes I say ‘room temperature’ but things aren’t too bad if you don’t totally listen. This is one of those instances where I really mean it. Since we’re melting the chocolate, if we were to blend it with cooler ingredients (think sour cream and buttermilk) it will seize. So along these same lines, let the melted chocolate cool completely, with periodic stirring, before moving on to the next step. Make Ahead Tip. You can bake the cakes and let cool completely in the cake tins. Once cooled, wrap the tins tightly in plastic wrap + foil and store at room temperature. Every time I made this dark chocolate cake I baked the cakes one day and then frosted the next. I don’t have you trim the cakes or put one upside down or any of that. Let’s just keep it simple. This dark chocolate cake has not been tested with any other pan size besides the 6-inch cake pan. If you use something bigger or smaller you will need to adjust the bake time accordingly. 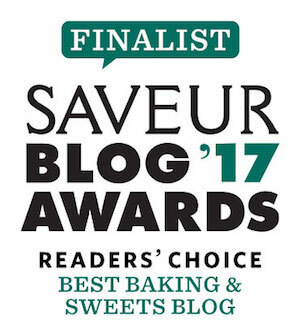 Please leave notes in the comments below to share with other bakers (and me!) if you make any changes to the recipe! Thank you! *I used two small sheets (2×2) for this cake. If you are new to using gold leaf, you may want additional sheets. Preheat the oven to 350 degrees F and place a rack in the middle of the oven. Butter + flour three, 6-inch cake pans. Place your chopped chocolate + oil in a medium, microwave-safe bowl and microwave on high for 1 minute. Stir until all of the lumps are gone and the chocolate is completely melted. If your microwave runs hot, cut back on the time so as not to burn your chocolate. Set aside, stirring periodically, and let cool completely . Whisk together the all-purpose flour, corn starch, cocoa powder, baking powder, sea salt and baking soda in a medium bowl and set aside. In an electric stand mixer fitted with the paddle attachment (or you can also use a regular bowl and spatula) add the melted chocolate mixture, granulated sugar and brown sugar and blend on low until blended together. Then add the sour cream, eggs and vanilla. Blend on low until mixed. Lastly, with the mixer on low add in your buttermilk + espresso. Scrape the sides and bottom of the bowl to make sure everything is well blended together. Take the bowl out of the stand mixer. Throw your flour mixture into the chocolate-sugar mixture and stir until just blended, in as few strokes as possible. The cake batter will appear lumpy, like muffin batter. Put about 2 cups of batter into each cake tin. Smooth the tops a bit so they’re level and tap the tins on the counter to release any trapped air bubbles. Put the tins on a baking sheet and shove on the middle rack of the oven for 30-35 minutes. When done, insert a toothpick into the center of the cakes. If it comes out clean, they are done. If it comes out a little gooey, put them back in for a couple more minutes. As soon as they’re out of the oven, set the cake pans directly on a cooling rack and let them start to cool down. To frost, set the first layer flat side down. Glob about 1 cup of frosting on the top and gently smooth over. Get down to eye level and make sure it’s level. It doesn’t need to look perfect, just level. Set the second layer, flat side down, on top of the frosting. Glob 1 cup of frosting on top and smooth until it’s covered and even. Set the third layer on top, flat side down, making sure all of the sides are even and your cake isn’t leaning. Gently adjust if necessary. Put at least 1 cup of frosting on top and smooth until level. For the sides of the cake, I like to start by filling the area between the layers with big spoonfuls of frosting. Once those cracks are filled, start patching globs of frosting around the cake. 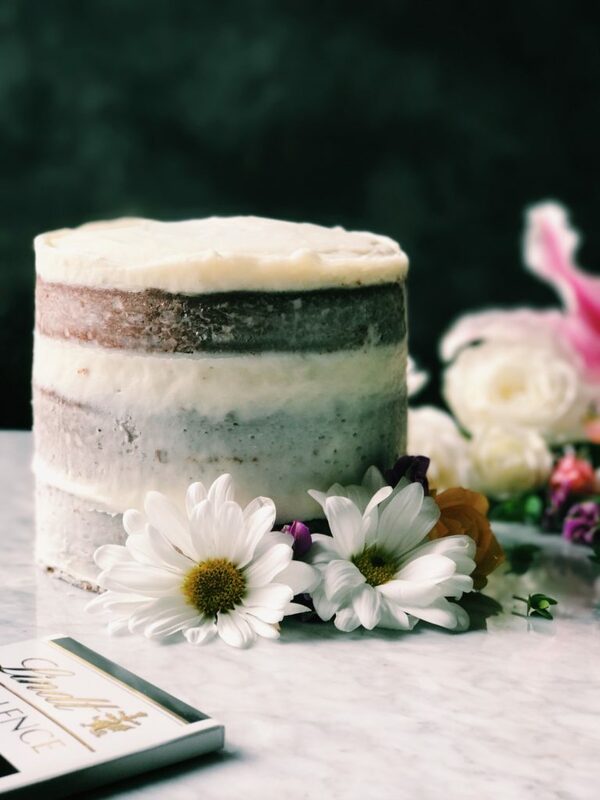 Once it is mostly covered in frosting, grab something with a straight edge (such as a bench scraper) and run it around the outside edge of the cake to smooth the frosting and show some of the cake beneath. 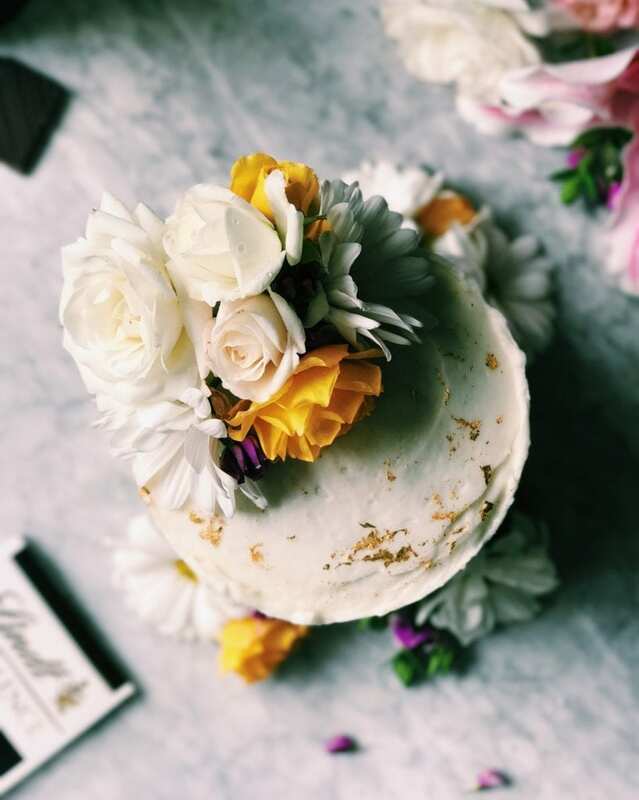 Continue until you get that rustic, naked-cake vibe we’re going for. Periodically clean your bench scraper and continue until smooth. I think the best tip for frosting a cake is to chill…don’t stress…and pretend that every naked spot, curve and dip is exactly where it should be. That’s pretty much how I leave the house every day. 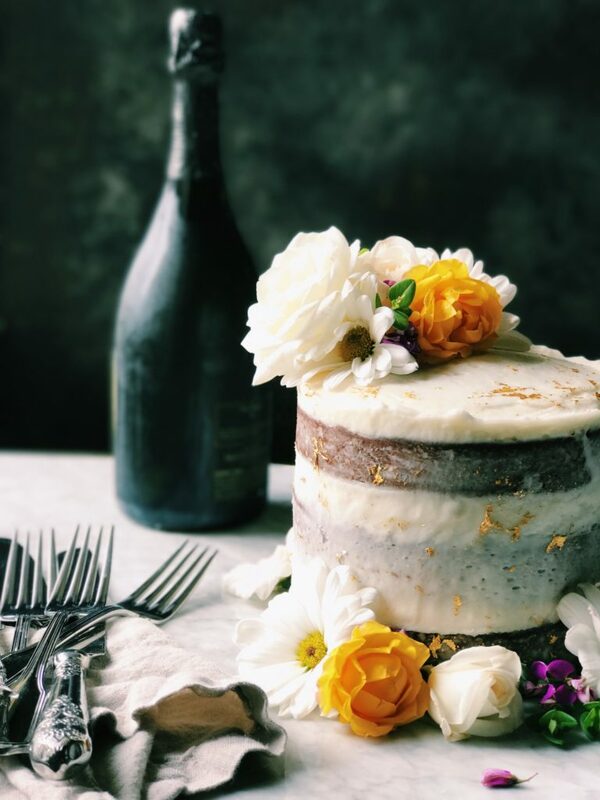 Let your cake sit at room temperature for 1-2 hours before you move on to the gold leaf…you want the frosting to be dried and firm before proceeding. Gold leaf… Using a clean, small-size paint brush, paint bits of water randomly on the cake. Use the tissue paper to press small bits of gold leaf against the wet spots, using your paint brush to help break off little pieces. Then gently brush the wet brush over the gold leaf on the cake, to create a rustic, antique look. This takes patience. And practice. Don’t panic if a large chunk gets on there or it starts to fold over on itself in clumps. Take a deep breath, wet your paint brush and gently brush and move the gold leaf around the dark chocolate cake. Your first go will not be perfect…unless you have mad skills that I know nothing of. But keep at it and you’ll get the hang of it. I like to have the gold leaf sporadically around the sides and parts of the top. For me, less is more. Place flowers along the base of the cake and also on the top of the cake. For the top of the cake, I like to focus on one quarter of the top of the cake. Stand back. Look at her. She’s stunning. You did good. Thanks so much for making this dark chocolate cake!! Tag me @displacedhousewife #displacedhousewife so I can see your gorgeous cakes!! I made this yesterday for my moms birthday, and the entire family loved the cake. Great job, thanks for sharing this recipe. I made this cake this weekend and used 8″ cake pans. It worked just fine. One thing I’ll do next time is line the pan with parchment paper. Makes it easier to take the cake out. A couple of the cakes broke in half when they came out. The recipe is absolutely delicious! I didn’t try the gold leaf and instead sprinkled some clear sprinkles on top. This cake screams, celebration and indulgence! I am so tempted to try after trying your gingerbread cake for Christmas which was such a hit. 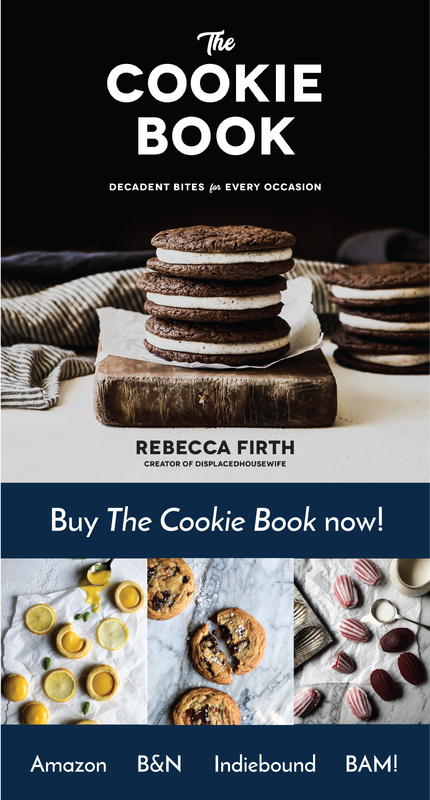 You won’t believe it, I just stopped by to see what new yummy things you’d posted and I was actually looking for something to bake with champagne for my husband’s bday. Lucky me, this cake is exactly what I wanted! Happy to find you; great recipe, great photos, great story ! Have a healthy and prosperous 2017.! 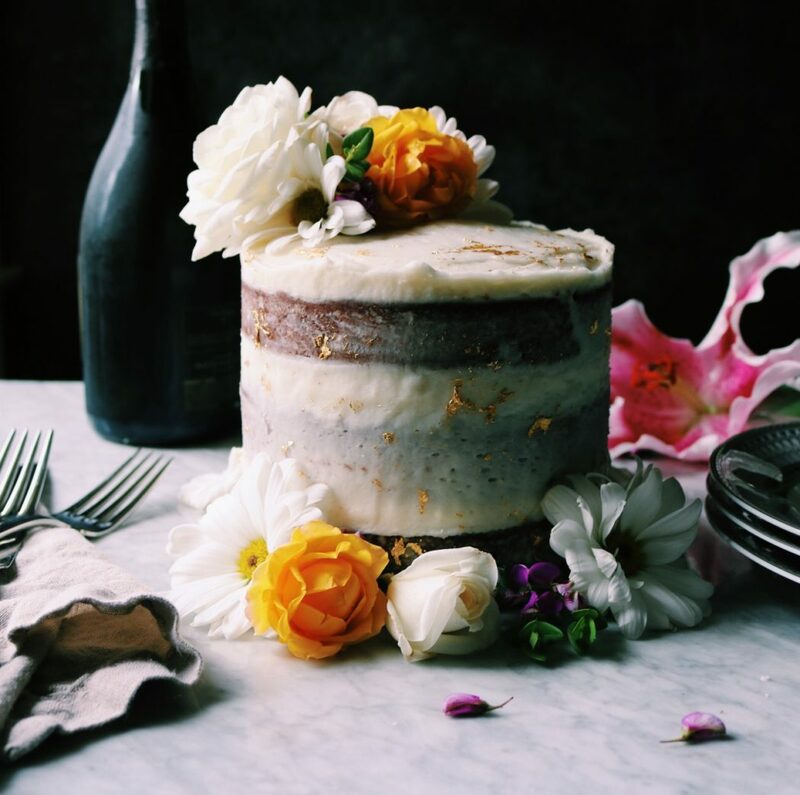 Such a gorgeous gorgeous cake and styling. In love with all the flavors my dear. A perfect way to celebrate. Happiest 2017 to you!! May this bring more sweetness. I love that you’ve found another reason for me to indulge. It’s hard to go cold turkey when the holiday noshing is over. I want those small cake pans. They make the cutest cakes ever. So beautiful! What a gorgeous cake Rebecca! Absolutely perfect for a special event like the Golden Globes! 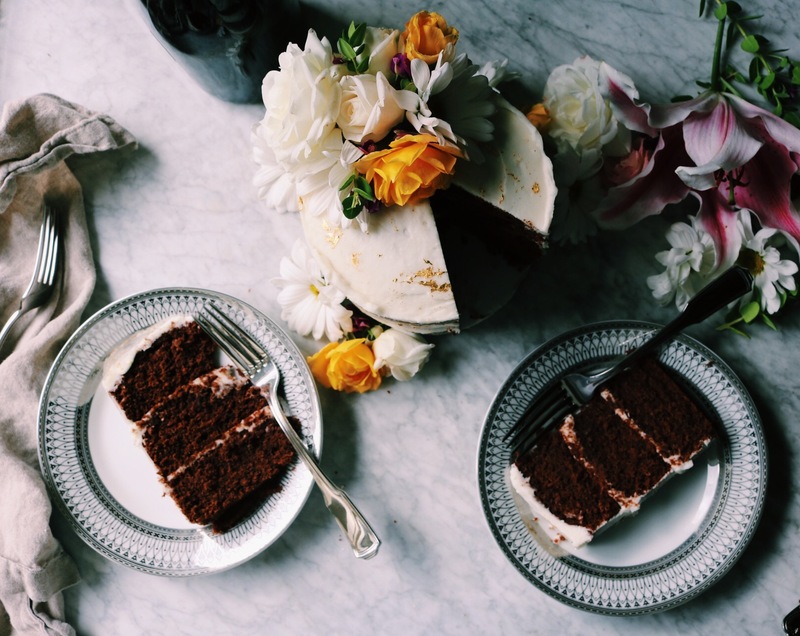 Nothing better than a deep, dark, rich chocolate cake and that champagne buttercream?! Wow! Just stunning! This is such a stunning cake! I’m swooning over that buttercream. :) Happy New Year! Thank you so much Laura!! From this day forward, I’m thinking champagne in everything!!! Wow this looks amazing, can’t wait to try the recipe!